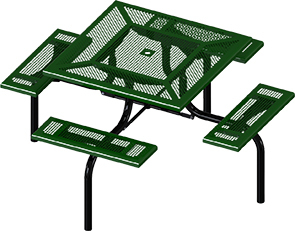 The square span leg picnic table with perforated pattern steel top provides style and utility for outdoor recreation areas. Rounded corner top and seats offers comfort and safety, great for around playground areas and kid focused facilities. The perforated punched surface pattern allows water to drain and prevents standing water. Designed with superior performance in mind, the minimalistic span leg frame is constructed with pre-galvanized 1-5/8"O.D. round steel tubing finished in ultra-resilient powder-coating. The span leg frame offers a spacious walk through design, making better convenience for the community to rest, relax and enjoy the atmosphere.